This pasta with mushrooms, olives, feta and pesto is a quick and easy pasta recipe that works well either hot or cold. It’s an earthy, savory pasta dish featuring mushrooms sautéed to a golden brown. The pasta and mushrooms are tossed with an easy, lemony pesto sauce. Then olives, salty feta and tossed pine nuts are added to the pasta and mushrooms to finish the dish. The pesto is a simple combination of italian parsley, lemon juice, garlic, parmesan cheese and a little olive oil. Just whirl it up in your food processor and it’s ready. I used a small/mini food processor to make the pesto. I love the earthy, hearty texture of mushrooms. I used baby button mushrooms but you could substitute any type of mushroom you want in this dish. The important step is to sauté them so that they become a lovely, caramelized, brown color. I’m a big garlic fan and have included a fair amount of garlic in this dish. The mushrooms are sautéed with garlic and there’s garlic in the pesto as well. You want to make sure that you sauté your mushrooms so that they caramelize and turn brown. The secret to this is to add your sliced mushrooms to your sauté pan and cook over medium high heat without stirring for 3 minutes. As they cook, they will release their juices, which will evaporate as it cooks. This way your mushrooms will turn a lovely brown – rather than stay a dull color. The pesto is a chunky type of pesto – not an oily type of pesto. When adding the pesto, add it to the pasta first, once you’ve drained the pasta. Adding it to the hot pasta will help it melt and cover all the pasta equally. After you’ve added the pesto to the pasta, add all your other ingredients. I used italian parsley for the pesto. Italian parsley has flat leaves – rather than curly leaves. 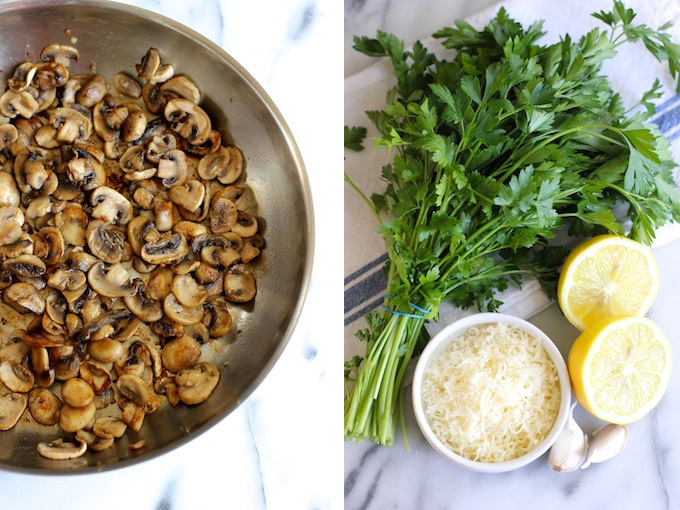 If you can’t find italian parsley regular parsley will work just as well. This pasta dish works well as leftovers, so make a little extra so you can pack it up for lunch the next day. 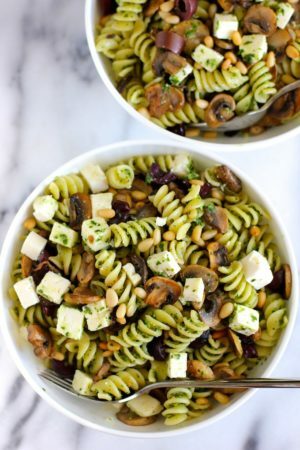 A savory, earthy pasta dish featuring sauteed mushrooms, olives, feta and a fresh easy pesto sauce. 2 cloves of peeled garlic – minced or put through a garlic press. Slice mushrooms into thin slices. Roughly chop olives and set aside. Add parsley, parmesan, lemon juice, olive oil, garlic cloves and black pepper to a food processor and blend until pesto is pureed. I used a small/mini food processor. Cook pasta as per box instructions. In a saute pan, saute mushrooms in one tbs olive oil. Let the mushrooms cook, without stirring, over medium high heat for 3 minutes. Then add minced garlic and stir. Continue cooking mushrooms until they are a golden brown. Add pesto to pasta and toss to combine. Add sauteed mushrooms, olives, feta and pine nuts. Toss to combine and serve. Lovely touch sautéed mushrooms with pasta that has a lemon , garlic pesto.Delicious. The pesto really makes this dish and the earthy mushrooms too! Thanks for leaving a comment and a rating! Thanks so much for letting me know, Darlene! Your blog is so beautiful. Each time I visit I find something more that I love! Thanks so much, Robyn – I sent you an email! I eat this combo all the time- its so delicious and simple! Thanks, Emma – I love this combo too. Mushrooms, pesto and pasta really go well together! Geraldine, I’ve been reading your blog for a while, but work is very hectic and only now could write. I did this pasta recipe tonight and it became an instant hit. Thank you very much! Thanks so much, La Torontoise! So glad you enjoyed the recipe and thanks for taking the time to let me know – I really appreciate it. Hope you have a wonderful weekend too! What a wonderful pasta! My boyfriend loves mushroom and when I cook this dish for him, he can’t stop saying : ” It’s so good, it’s so delicious, babe”. Thank you for you recipe . Thanks, Calie. So glad you enjoyed it! Wow! This looks so good! I love everything in this so putting it all together sounds delish! Thanks, Brittaney! Hope you’re have a great Memorial day weekend. 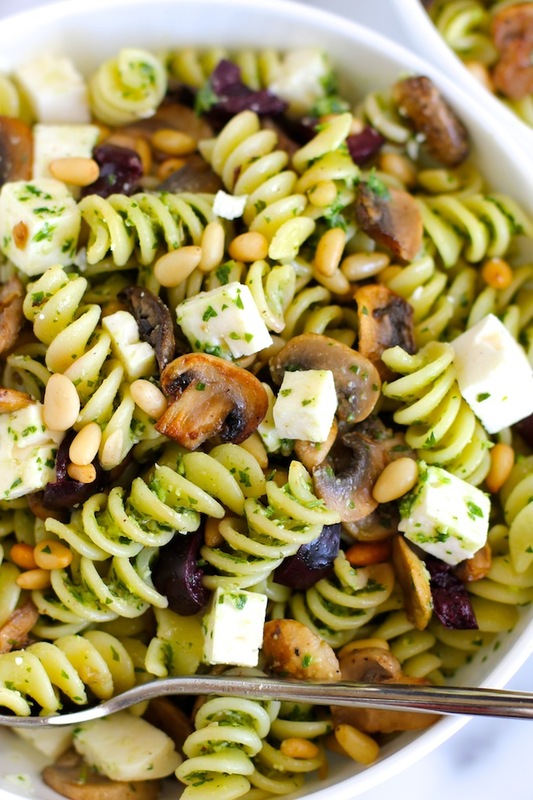 Hi Lily – pasta, feta and mushrooms are a really great earthy, salty combination – plus the olives of course! Hope you try it! Hi Medha – I’m a big olive and mushroom fan too – thanks for the pin! This looks like a seriously flavorful pasta recipe! That pesto sounds amazing, I will have to try parsley pesto a try! Thanks for the mushroom tip, mine are always dull. Looks fantastic! 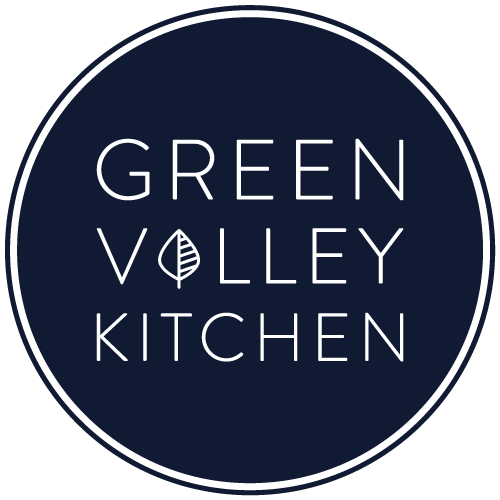 Hi Denise – parsley pesto is great – it’s a milder pesto than basil – but the lemon and garlic give it a great kick – hope you try it. And no more dull mushrooms! I love a good pasta salad. The pesto in here sounds perfect especially along with the mushrooms and feta! The flavors, textures and nourishment of your recipe, Geraldine, is perfection! Pasta is pure comfort food and paired with a garlicky pesto, it’s something I crave! I bet this is excellent cold, as leftovers, too! Thank you for your tip regarding the mushrooms…. I tend to feel the urge to stir, stir, stir…. Looking forward to this, Geraldine! Thank you! Hi Traci – pasta and pesto are so great together – what a great base. Hope you try it! This is one pasta I can get on board with! I am loving those big chunks of feta in there! Pesto is such a great pasta topper and I love that you can pretty much make it out of any green herb or vegetable you can find! This looks perfect! Thanks, Izzy – I’m a huge pesto fan too! Lemon-y pesto made with Italian parsley and parmesan is a sauce I’d have trouble saving for the pasta! Love the flavors of this dish, Geraldine! I made some extra pesto, Annie, so I could use it on sandwiches during the week! I love pesto and I love your idea to add mushrooms for a nice meaty texture. And feta and olives must give this such a great salty flavor! I’m all about easy dinners like this – thanks as always for the inspiration, Geraldine! You know me, Julia – I’m all about easy meals! I’m a huge pesto fan – you can change it up so easily and it adds so much flavor to a dish. Thanks! Hi – this looks so tasty. I really appreciate all of your helpful tips, too. Thanks so much, Jojo. Hope you enjoy it if you make it!